A month from today is December 1st, and I'll be doing my first December Daily album. 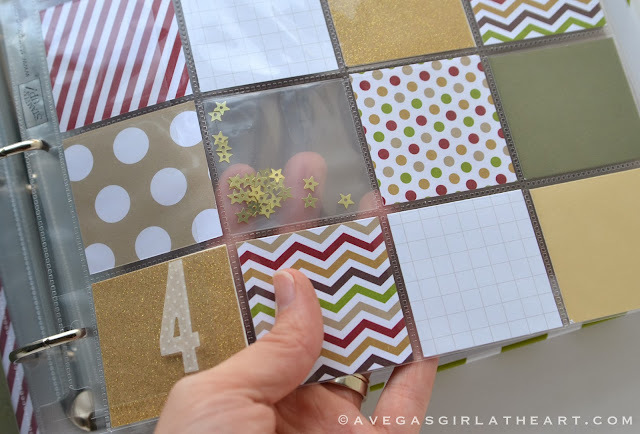 If you haven't heard about December Daily, you can visit Ali Edwards' blog and read up on her project. In Ali's words, "December Daily™ is an album project that documents the 25 days leading up to Christmas." Last year, I used Ali's overlays and journaling cards and included a version of December Daily inside my Project Life album. 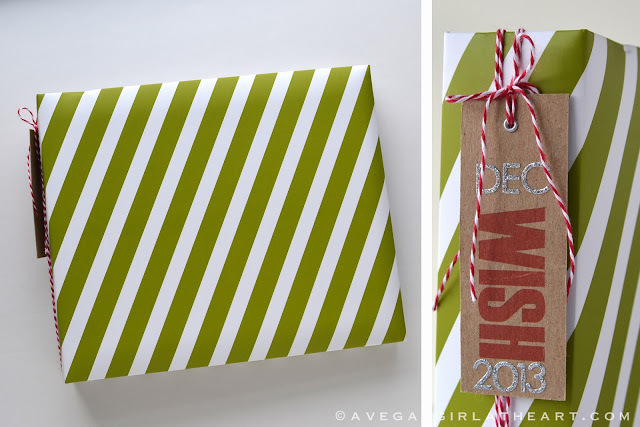 You can check out my posts from last year if you click on my December Daily tag. This year I wanted to try a separate album. The holiday season is a stressful one for me, and I often find myself depressed. I am really hoping that working on this project will boost my mood. But in order to reduce some of the craziness of trying to complete an entire mini album during the holidays, I put together "foundation pages" to get a base. Ali has some fabulous posts about her foundation pages and how to put them together, make sure you check them out. 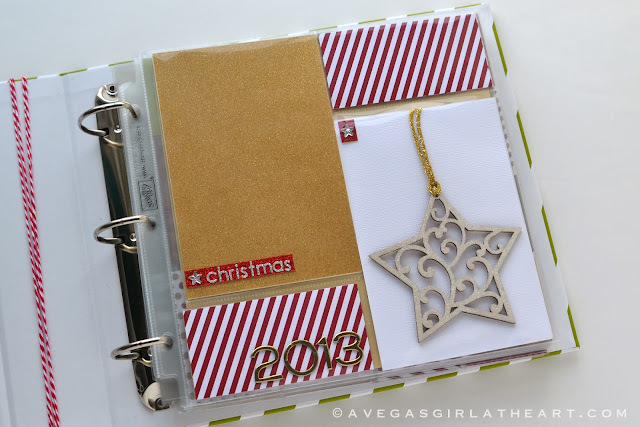 I am using a bunch of products from Stampin' Up! along with items from my own stash and a few things I've picked up here or there. This is the post about my products from Stampin' Up! if you'd like to see the items I ordered. I spent last week putting my these pages together, and wanted to share them with you. I also have a little Silhouette freebie for you if you keep reading. :) (You know you want to anyway). 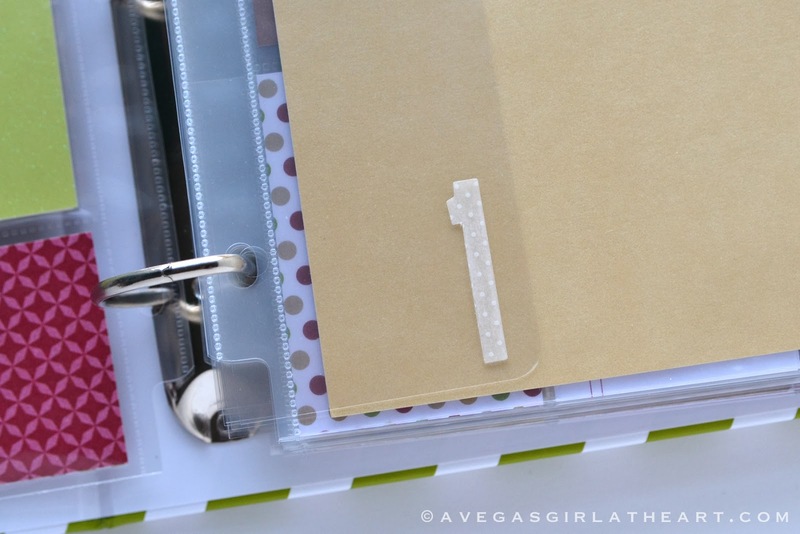 I ordered the 8x8 binder from Stampin' Up! and used a cute little "wish" tag with some baker's twine to hang on the side. The glitter sticker letters are from Recollections. 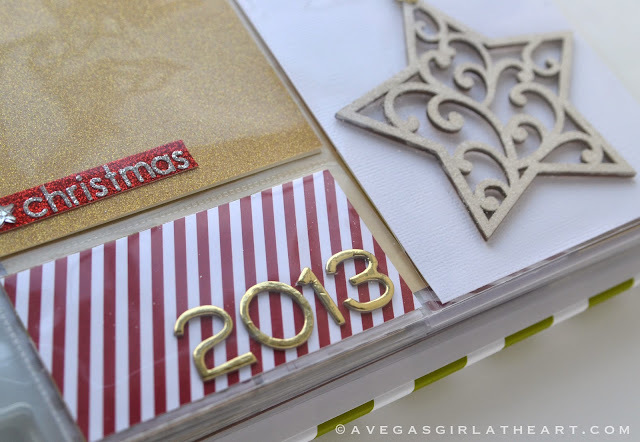 More of the silver glitter alpha stickers, red glitter ribbon from American Crafts, and some gold American Crafts thickers for the year. 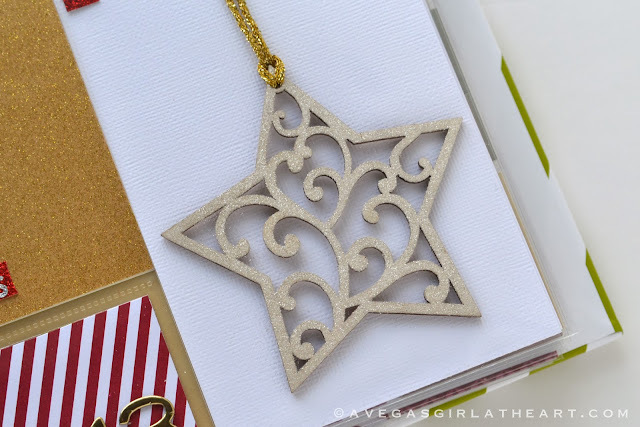 I wanted this beautiful wood star that I found at Michaels on my cover page. To make it Christmas-y, I used some Tsukineko Brilliance ink with some Martha Stewart crystal glitter. The gold rope I tied it with was from the $1 bin at Joann's. For dividers for each day, I used some transparency film cut to 2" wide by 8" tall and hole punched. I die cut vellum numbers using my Big Shot and the Tim Holtz Block Talk die. I used my Xyron sticker maker to attach the vellum - you can't see the adhesive this way. Here are all the foundation pages for the album. I left them simple - very few embellishing details but every pocket filled. My plan is to have one large photo (or perhaps a large photo with a couple of smaller photos) in the 8x8 page protectors for each day, along with smaller photos and journaling in the pockets. I don't know if I want paper behind my photos or how many I'll have, so I filled all the pockets and can always remove paper later. The photos below are just some collages - if you'd like to see the pages closer, please check out my December Daily 2013 gallery. Again, you'll want to check out the gallery to get a better look at these pages. 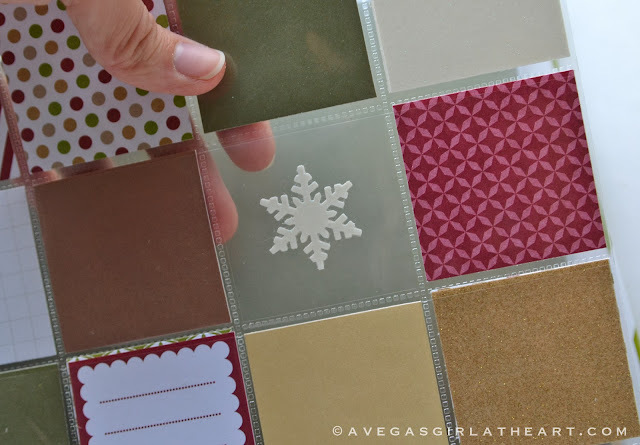 This Merry Christmas circle is a cut file from the Silhouette store by Lori Whitlock. 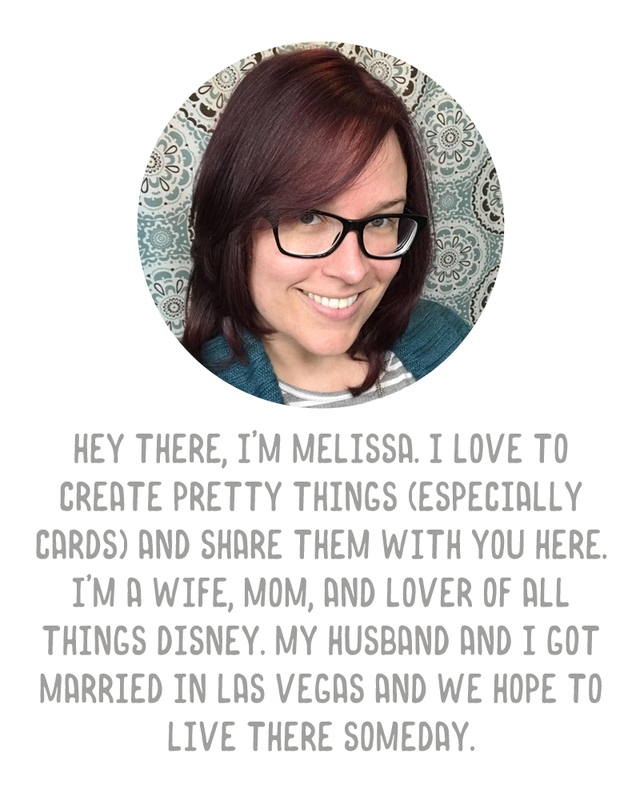 I resized it to 2"x2" to fit my pocket and placed it over a piece of glitter card stock. I added a rhinestone in the center. 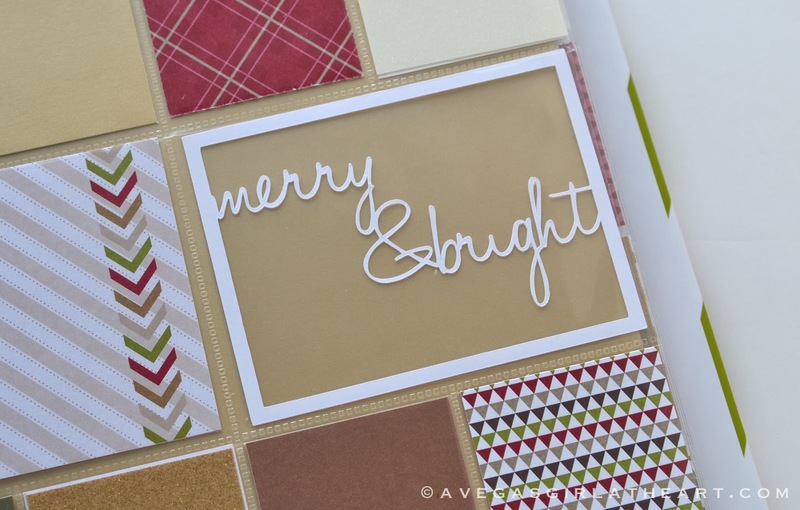 The "merry & bright" is a cut file that I designed. And I'd love to share it with all of you. You can click here to download the .studio file. Just a warning that it is very delicate so remove it carefully from the mat! I used a 3x4 sheet of transparency to re-align the lettering after I took it off of the mat, used another 3x4 transparency over the top, and then slid both together inside my pocket so that the lettering didn't get wonky from putting it in the pocket. 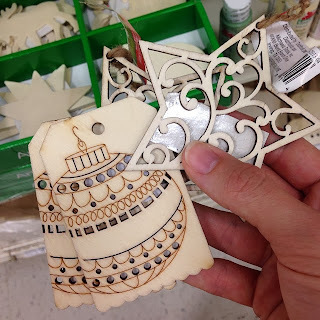 It's hard to see the glitter on the snowflake above, but this is a transparency sandwiched between to snowflakes punched with a Martha Stewart punch. I used the transparency to make sure the snowflake stayed in the center of my pocket (just used my Xyron to add adhesive and lined them up back to back with the transparency in the middle). Finally, some gold star sequins. I bought them on Amazon and you can get a bag of these for under $4. So those are my December Daily foundation pages! I can't wait until next month when I can really work on it. 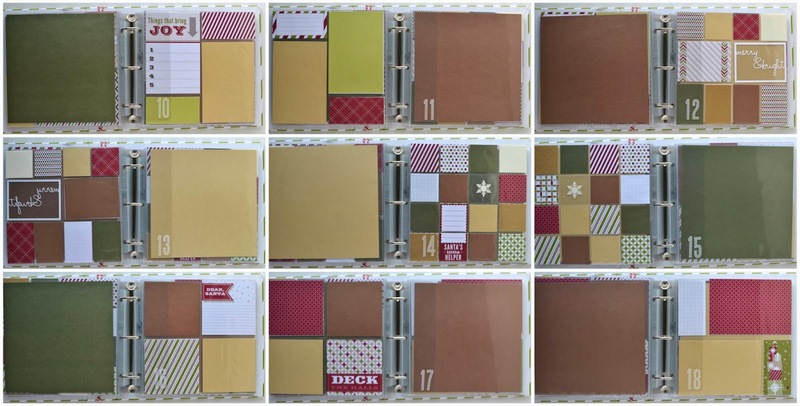 Feel free to link up to your own December Daily foundation pages in the comments! Where did you find the 2x2 pages? did you create them yourself or repurpose from another kit? Check out the link above where I show the products I bought! Wow, this is a really lovely album! 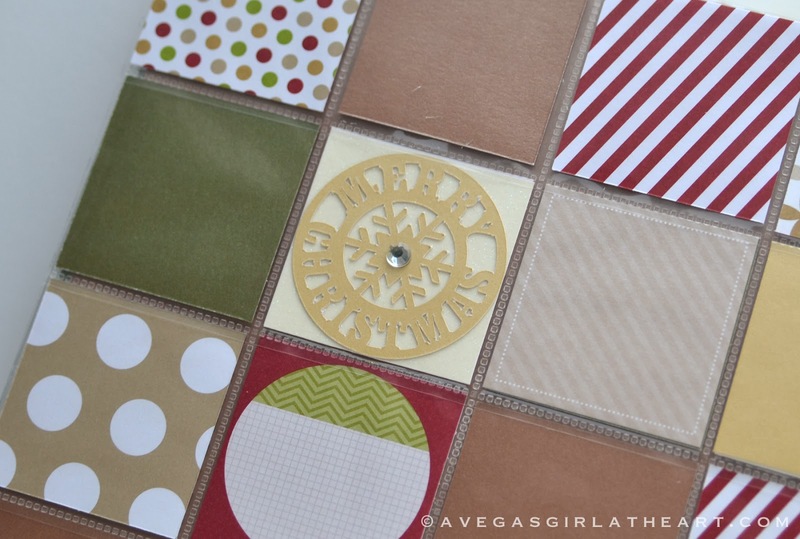 Love this idea!...and such a great thought to go ahead and make some foundation pages! I usually start too late and get overwhelmed...how smart to go ahead and make them!...very, very nice! And thanks for the .sil file...very nice! These are just gorgeous! Did you get the other wood embellishments at Michael's as well? Love them, can't wait for December to start. Oh wow! This look so great. Can't wait to see what else you do! That's some album! Lovely! Have fun putting it together the rest of December! Also, thanks for the overlays--love them! I love this album and appreciate the studio file. Thanks!